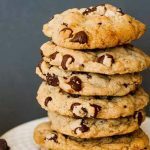 A traditional, old-fashioned chocolate chip cookie that entirely satisfies that cookie craving. A simple vegan recipe that you’ll make time and time again! Preheat oven to 350°F. Place a piece of parchment or a silicone liner over a baking sheet, or lightly oil the pan. Combine the flour, baking soda, and salt in another bowl. Set aside. Place the room-temperature margarine (I warm up chilled margarine in the microwave for about 20 seconds) in another bowl. Add the sugars and whisk vigorously for about 2 minutes. The mixture should become light and fluffy and take on a light beige color. Add the flax egg and the vanilla to the butter mixture, and whisk well until combined. Add the dry flour mixture to the wet mixture, and stir together with a rubber spatula or wooden spoon just until combined – do not overmix. Add the chocolate chips and gently fold into the batter. Drop by heaping tablespoonfuls onto the prepared baking sheet. Bake for 12-14 minutes, rotating once, until just barely beginning to brown on the bottom. They will look underdone on top. Remove from the oven and let cool on the baking sheet for about 5 minutes. Transfer to a wire cooling rack and let cool 10 minutes before enjoying – if you can wait! Measuring the flour by spooning it lightly into a measuring cup. If you generally scoop your flour out of the bin, you may want to use 1 1/4 cups (though scooping is never a great way to measure flour and can lead to inconsistent results – so it’s best if you spoon it). I recommend using the Earth Balance stick margarine, as the tub version can be a bit greasy. However, I have made these cookies with the tub margarine just fine as well. These are rather sweet, but that’s how I like my cookies. If you like cookies that are a bit less sweet, decrease the brown sugar to 1/3 cup.